Category:Food Products,Problem Solving In order to save time, some people consider putting sprinkles or sugar into the candy molds, then pouring the chocolate into the mold. Sprinkles end up on top; work saved, right? Well not really. The sprinkles or sugar will very likely get absorbed into the body of the candy. I did experiment with the process to give you an idea of what would happen. Here is the mold I used with pearls, sugar, and heart quins already inside. Sprinkles in a candy mold. Ready for the chocolate. The result of pouring candy melts over sprinkles. As you can see, the result isn’t that great. Interesting, but not great. 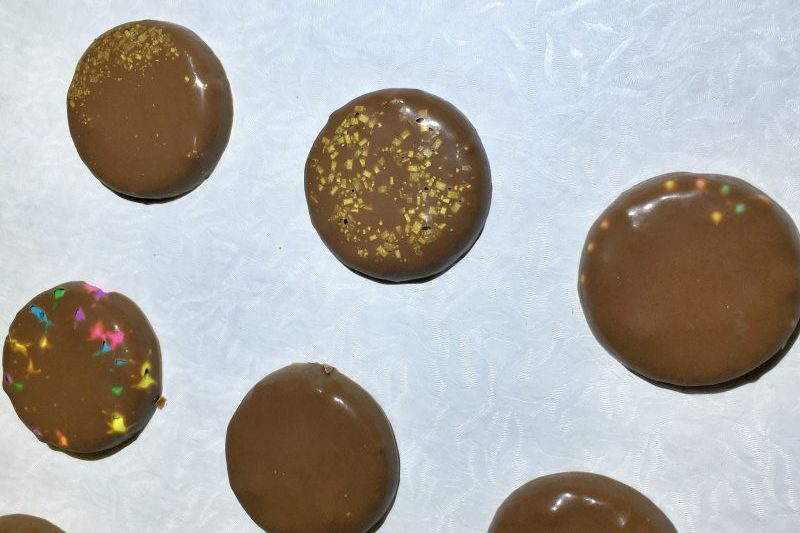 So… If you feel that you have to put sprinkles on top of a molded candy, think about brushing a thin layer of the same colored chocolate on the area where you want the sprinkles to be – if you want the candy to maintain one color. If you want, or need, to use a different colored chocolate, just make an attractive drizzle and drop the sprinkles right on top. Enjoy!